When the 1967 War descended upon the Middle East, Israel was urgently awaiting delivery of new Mirage fighters from France as well as other weapons systems needed to survive. When an embargo was placed upon Israel, these aircraft would remain in France and the Israeli Air Force had to work with the resources on-hand. To avoid facing another potential embargo in the future, Israel aggressively pushed forward to establish its own defense industry. One of the first projects on its list was to reverse engineer and build the Mirage V to their own specifications and this indigenous version was called Nesher (Vulture). As the Nesher proved itself in combat, Israeli Aircraft Industries had already set its sights on an improved aircraft which replaced the Nesher (and Mirage) Atar engine with the American J79 which powered the F-4 and F-104. This combination resulted in the Kfir (Lion Cub). To improve low-speed handling, strakes were planned for the nose and canards on the intakes in the Kfir C.2 but these were also added to the Kfir C.1s leased by the US Navy and USMC for adversary training duties. The one visible addition that was incorporated into the Kfir C.2 and not the F-21A was the dog-toothed wing leading edge. 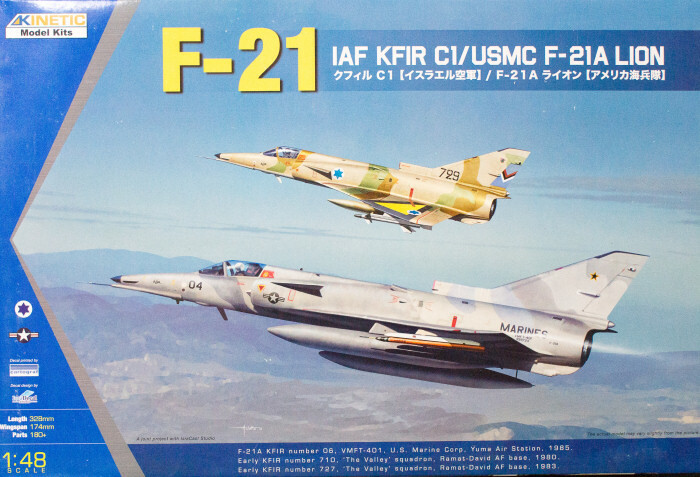 Until now, the only two real choices for building a Kfir model was Hasegawa's 1/72 kit which is a bit Spartan on details or find an aftermarket conversion (such as the set from TAC Scale Dynamics) for the 1/32 Revell Mirage kits. The ESCI 1/48 kit that has been reboxed by a number of companies over the years looks like a Kfir from a distance, but it has shape and detail issues which have daunted anyone attempting to build an accurate Kfir. With this release, Kinetic Models follows up the Kfir C2/C7 release from last year and renders your choice of the F-21A Lion or Kfir C1 variants. The kit is molded in light gray styrene and presented on nine parts trees plus a single tree of clear parts. 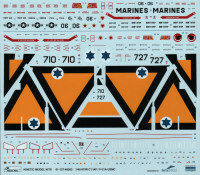 These decals are nicely done and include a nice suite of airframe stenciling and weapons markings. Painting instructions are provided using FS equivalents. This is another very nice release from Kinetic and fills in the gap for an accurate early Kfir or F-21A kit.